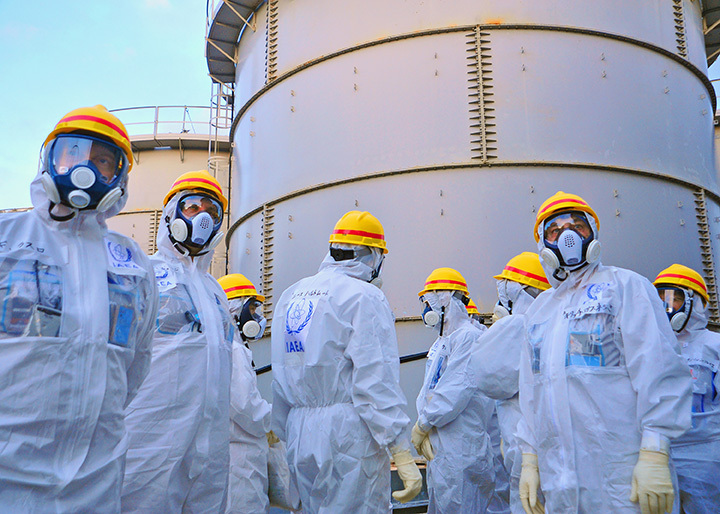 A team of IAEA experts check out water storage tanks TEPCO’s Fukushima Daiichi Nuclear Power Station on November 27, 2013. The expert team was assessing Japanese efforts to decommission the stricken nuclear power plant. Photo: Greg Webb / IAEA, Flickr.com CC. Hastily scribbled notes documenting communications between emergency officials monitoring the Fukushima Daiichi nuclear power plant as the disaster unfolded on March 11, 2011 are still in place on chalkboards and whiteboards at the Environmental Radioactivity Monitoring Center in Fukushima Prefecture, Japan, as if frozen in time. Media representatives were invited in to the facility for the first time since the incident just this past November, as Fukushima University researchers measured radiation levels inside. March 11, 2019 will mark the eighth anniversary of the triple meltdown at the Fukushima Daiichi Nuclear Power Plant, following the 9.0 Tohoku earthquake and resulting tsunami, which knocked out all power to the plant, including the backup generators. Without power, the cooling systems were inoperable, causing a triple reactor meltdown and hydrogen explosions of spent fuel rods in storage, which sparked concerns about radioactive contamination across the Pacific Ocean to the West Coast of the U.S. While in the months following the catastrophe the world learned that the disaster was far more serious than Tepco, the operators of the plant, and the Japanese government had initially claimed, public concern about widespread contamination on U.S. shores has faded over the years. Cesium-134, one of several radioactive isotopes released in the incident, is called the “fingerprint” of Fukushima because it does not occur naturally in the environment and has a relatively short half-life of only two years (the half-life of radioactive isotopes is the length of time it takes for half of the radioactivity to decay—therefore any cesium-134 detected would have had to come from a recent release). While C-134 was detected 100 miles due west of Eureka as recently as November 2014, confirming the arrival of Fukushima currents to our shores, the amount was well below the limit allowed by U.S. drinking water standards. Cesium-137, which exists as residual background radiation leftover from nuclear testing in the mid-1900s (with a half-life of 30 years), is still being detected along the entire west coast at levels higher than would otherwise be present, though still well below government-established safety limits. While experts like marine chemist Ken Buessler, with the Center for Marine and Environmental Radiation at the Woods Hole Oceanographic Institution (WHOI), affirm the data currently show no cause for health concerns for humans or marine life on the U.S. coast, the continued collection of data is providing important information regarding currents, ocean water mixing, and the transport of radioactive contaminants, which will be useful for assessing danger from potential future nuclear incidents. Cesium has also been found in a surprising place—beneath the coastal beach sands close to brackish water tables up to 60 miles away from the meltdown site. Scientists have learned that where currents washed highly contaminated water onshore, the cesium “stuck” to sand particles in brackish water (a mix of salty seawater and fresh groundwater, as is found under beaches), but becomes “unstuck” when soaked with salt water. Therefore, the accumulated cesium embedded under beaches along Japan’s coast is being slowly released over time as waves continue to saturate the sand. Scientists estimate that the amount of cesium being released in this manner is equal to that of the ongoing releases and runoff from the disaster site itself, and from outflow from rivers continuing to carry cesium from land to the sea. This too is important new information that could be useful for disaster planning for other coastal nuclear plants. In the U.S., no government agency is monitoring the spread of low-level radiation around the world from the Fukushima meltdowns. Most of the data collected on our west coast and in the Pacific is from volunteer-collected samples with analysis by Buessler and his team. The Fukushima crisis is far from over, however. Millions of tons of contaminated, radioactive water (used to keep the molten reactors and spent fuel rods cool to prevent further radioactive releases, and from pumped groundwater that continues to seep into the reactors’ basements) is stored on-site in more than 900 tanks. Despite efforts to prevent seepage using “ice walls” (man-made permafrost), and special processing technology intended to clean radionuclides from the water, Tepco was forced to admit late last year that these efforts had failed, confirming that levels of several long-lived, cancer-causing isotopes were still present in the stored water at more than 100 times legally permitted levels. While more water continues to become contaminated every day, the only known plan to deal with it is to release it all into the ocean. This is of great concern to many because of the dangerous nature of these particular isotopes. Strontium-90, for example, has a half-life of 28.8 years and mimics calcium once ingested. If ingested by fish, or further up the food chain by people, it becomes stored in the bones, which greatly increases the risk of cancer. If this stored water is released into the ocean, fish that migrate long distances could potentially carry these isotopes across the Pacific. It remains to be seen what will ultimately become of the situation. Visit this article on the NEC website for links to prior EcoNews articles with more information on the Fukushima disaster, incidents at the Humboldt Bay Nuclear Power Plant, and the onsite long-term storage of spent nuclear fuel from the now-decommissioned Humboldt Bay plant.